Q1: What are the effects of plasma treatment on material surface? Plasma treatment can be described as a bombardment of ions on the processed material surface. As such plasma treatment results in three effects: (1) heating of the material, (2) surface cleaning (i.e. oxide removal, delubrication) and (3) surface polishing ( i.e. increased micro-roughness, decreased macro-roughness). This makes plasma treatment suitable for applications that require high quality of surface finish. Wet lubricants evaporate and oxides layers break under the mechanical impact of ion bombardment (micro sputtering) in the plasma chamber. Ion bombardment on the material surface leads to surface oxide layer removal and surface decontamination. Plasma process can also result in a chemical reaction on the wire surface, providing that the right choice of processing gas and process parameters is achieved. Q2: Can surface damage occur during aggressive plasma treatment? Plasma treatment does not damage the material surface unless extreme and unreasonably powerful plasma is applied to the material. Plasma power input is computer controlled and applied proportionally to the speed during the ramp-up and ramp-down ensuring that overheating does not occur. Q3: What temperatures can PlasmaANEALER safely achieve? 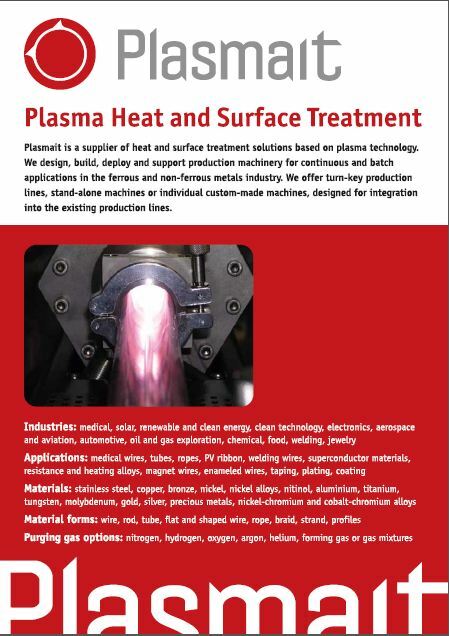 PlasmaANNEALER can safely achieve temperatures well over 2500°C, if sustained by the processed material. The maximum temperature is limited by the melting point of the material. Annealing temperature is not generally a limitation in common applications. Energy conversion efficiency of plasma treatment generally increases with temperature, which makes plasma treatment suitable for high-temperature materials such as tungsten. Q4: What is energy conversion efficiency of plasma heat treatment? Energy conversion efficiency is a ratio between electrical power input into plasma and heat transferred to the processed material. Energy conversion efficiency of plasma heating is over 95%. This means that over 95% of the electrical power conducted into plasma converts into heat in the processed material. Q5: What is the processing speed of PlasmaANNEALER or PlasmaCLEANER? Processing speed of plasma process depends primarily on application, material mass throughput and machine design. The output of PlasmaANNEALER can be compared to the outputs of induction and resistive annealers. However, processing speed depends entirely on a specific application and the requirements of the production process. As a rough guide, the output of typical PlasmaANNEALER can be compared to a 10 or 20-line conventional tube furnace. The process speed of PlasmaCLEANER is a function of surface contamination of the processed material. Q6: What are the processing costs of PlasmaANNEALER? PlasmaANNEALER has one of the lowest operations costs when compared to traditional continuous annealing processes. This is due to high energy conversion efficiency of the plasma process, and no heating-up/cooling down times. Energy saving is subject to application and process patterns and can be as high as 50% compared to a conventional furnace. The consumption of inert gas is also lower than the consumption of gas in tube annealers. This is due to the fact that the plasma system utilities low-pressure purging environment. Controlled low pressure purging environment also minimizes the possibility of uncontrolled purging gas leakage. PlasmaANNEALER has low maintenance cost. Production costs depend primarily on application and are as a rule lower than the production costs of alternative heat and surface treatment processes per unit of output. Q7: What entails the maintenance of a plasma machine? Maintenance of PlasmaANNEALER or PlasmaCLEANER involves primarily maintenance of vacuum pumps.The parts that require regular maintenance are vacuum filters and oil in the vacuum pumps, electrical contacts and the inner tube in the plasma chamber. 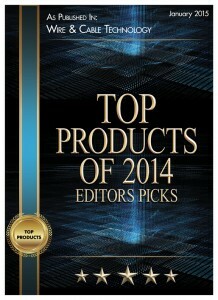 All of these are low cost parts or consumables. The dirt that accumulates in the plasma chamber need to be wiped off occasionally depending on the amount of dirt on the wire. The surface deposits and lubricants removed from the surface during plasma treatment are sucked from the plasma chamber with the vacuum system and exhausted via an exhaust pipe. The impact of plasma is concentrated only on processes material and does not impact any parts of the machine. The components of the transport system are not in contact with hot processed material. This minimizes the wear on the transport system (pulleys, capstans). Q8: Can regular maintenance be performed by the operators? Yes, maintenance of plasma machine is performed by the operator that passed a basic maintenance course. Q9: Where do the dirt, lubricants, soaps and other surface deposits end up, once they have been removed from the surface during plasma treatment? Dirty deposits, soaps, lubricants and oxide layers break under the ion bombardment in the plasma chamber or evaporate at high temperature. The ashes are deposited on the bottom of the chamber or in the vacuum pump filters. Volatile components of the residues evaporate into the process gas and are exhausted through the exhaust pipe. The flow from the exhaust pipe is smaller than the exhaust generated from a car. Q10: Can plasma treatment be used on very dirty or heavily oxidized wires? Plasma treatment is not designed for processing/cleaning very dirty and rusty materials. For dirty applications a precleaning system is recommended to reduce the amount of dirty deposits, lubricants and soaps on the wire surface prior to plasma treatment. Q11: Is it possible to manipulate the temperature of heat treatment during the operation? Yes. The temperature or intensity of plasma treatment can be regulated via power input during the process. The power input is automatically adjusted in line with the changes in production speed (i.e. during acceleration and deceleration) to maintain homogeneous mechanical properties from start to the end of production. The mechanical properties of the processed material (tensile, elongation) can be accurately manipulated through power input. Q12: How can the operator control mechanical properties of the finished product? What degree of wire softness can be achieved with plasma annealing? The operator can set the production parameters (including heat treatment power) for a given application by selecting an predetermined production recipe or by manually via the HMI. Annealing of materials that require certain time at elevated (annealing) temperature would involve tempering zone being fitted after the plasma chamber. In this way appropriate temperature profile can be set for materials such a some carbon steels. Q13: Is it possible to use plasma treatment for different materials and diameters? Plasma treatment can be used for different applications, subject to its design and purpose for which it was built. Plasma machines allow for managing of production recipes. Each production recipe determines preset production parameters. The operator can set the processing parameters manually. This is used for development and testing of new applications. The operator can save the production recipe for a new application into the HMI database for future use in production. Q14: What skills and training are required for operation of plasma machines. Can PlasmaANNEALER be operated by an operator of a classic annealing plant? The operator of plasma machine is usually required technician qualifications. Supervisor or production manager would commonly be engineers. Basic Training is provided as part of installation and commissioning of any plasma machine. This will equip the operator for mastering the operation, maintenance and safety of the machine. A further advanced training course shall equip the operator with all aspects of machine operation and safety, advanced manipulation, new application testing, trouble-shooting and advanced maintenance. Q15: What are the dimensions of PlasmaANNEALER? The size of PlasmaANNEALER depends on application, output and the above all the cooling system. PlasmaANNEALER for copper or copper alloys can be between 3m and 10m long, depending on application, output and machine configuration. Vertical configuration reduces the length of the machine. PlasmaANNEALER for stainless steel or nickel alloys would range from 6m to 20m, depending on output and application. The type of cooling system can greatly influence the total length of the machine. Plasma surface treatment machines such as PlasmaCLEANER are usually shorter. Their lengths range between 1.5m to 5m depending on application. Q16: What are the risks associated with plasma technology in wire manufacturing? What safety measures are incorporated in a plasma treatment machine? The risks associated with plasma process are generally limited to high-voltage installations. PlasmaANNEALER has a triple safety measure to prevent a contact with high-voltage installations. A safety guard covers all the high-voltage installations. The process shuts-down automatically if the safety guard is opened or if one of two contact with the wire is compromised. The machine also shuts down automatically in case of wire break or uncontrolled reduction in wire speed. Plasma emits high energy light such as the light emitted from welding. Further safety features are included in plasma machinery designed for hydrogen as purging gas. All Plasmait machinery has a CE or UL mark and comply to EU and North American safety standards. Q17: How hot does PlasmaANNEALER get during the operation and what is heat emission into the environment? Plasma module remains cold during the operation. PlasmaANNEALER is a contact-free device, which means that hot material does not conduct heat to the machine structure apart from minor heat radiation in the plasma chamber. The cooling section is covered with a guard for the safety of the operator. Q18: Can plasma escape out of the plasma chamber? Plasma cannot be released into the environment as it cannot be maintained in normal pressure. Q19: Is it possible to test plasma heat treatment on a different materials? Yes. Plasmait has a testing facility in Austria. We perform customer trials for a wide range of applications that include annealing or cleaning of wire, tube, strip or profiles. Plasma treatment for batch applications is also available for testing. We have experience in plasma treatment on a broad range or materials including copper and copper alloys gold, and precious metals, steel, stainless steel, a range of nickel and aluminium alloys, titanium, tungsten, tantalum, molybdenum, nitinol, super-conductive materials and many other alloys. Q20: Is scrap produced during the acceleration and deceleration? Can the processed material stop whilst PlasmaANNEALER is in operation? The power of PlasmaANNEALER is controlled automatically during the acceleration and deceleration to maintain the mechanical properties of the finished wire. PlasmaANNEALER automatically reduces the power input to minimum when production stops. PlasmaANNEALER can be put on a standby during idle process mode. Q21: What happens if the wire breaks during plasma treatment? Plasma machine would automatically shut down as a result of loss of contact or detection of unexpected fluctuation of the process. Please feel free to contact us on info[at]plasmait.com on by phone to discuss your specific application requirements in more detail.